MARTIN, S.D. (AP) — Quentin Riggins' family told him he was crawling in diapers when he first met their attorney, Fred Cozad. As long as Riggins can remember, the attorney's name was scrawled on a chalkboard his grandmother kept next to the phone with the names and numbers of her closest friends and family. 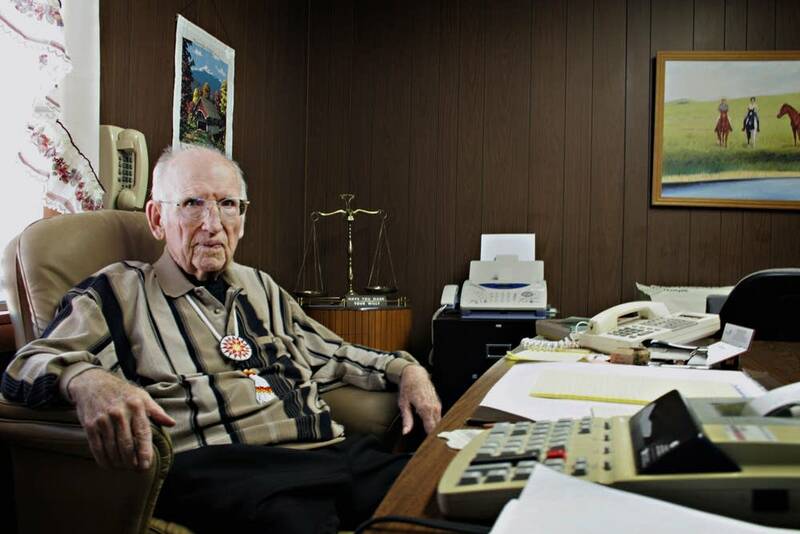 Today, Cozad is the only lawyer left in Martin, a community of about 1,000 people 150 miles southeast of Rapid City, and when the 85-year-old eventually closes his firm, there will be none. It's a problem seen more and more in rural communities - one that means people must travel farther for legal advice, slowing down the process and bogging down an already-crowded court system. Cash-strapped communities are spending more money to bring in lawyers from nearby towns for board and commission meetings, while businesses and estates that used to turn to one person for legal guidance are now forced to use firms with multiple specialists - making the process much less personal. In South Dakota, 65 percent of the state's 1,861 attorneys are in four cities: Sioux Falls, Rapid City, Aberdeen and Pierre. A lawyer himself now, Riggins, 32, said he enjoys working with rural clients but he would rather travel to see them than base his office in a rural area. Also, Rapid City, with a population of about 68,000, is as small a community as his wife will agree to live in, he said. Riggins' decision is not unusual. Census data shows that America's population is shifting from rural to urban. In 1910, 72 percent of Americans lived in rural areas. A century later, it was at an all-time low of 16 percent. Living in a city especially appeals to law school grads and other young professionals, said Susan Poser, dean at the University of Nebraska College of Law. "I think a lot of it has to do with the lifestyle," she said. "People at that age tend to want to be in a city. We're talking about 25-year-olds for the most part." The drive - which Riggins doesn't mind - can be taxing in rural areas. Emily Sovell is the state's attorney for Sully County as well as the city attorney for several towns in central South Dakota. Based in Onida, Sully County's seat, she sometimes drives as many as four hours roundtrip to attend a city council meeting after a normal eight-hour work day. Money also plays a role. While the cost of living in small towns is often less than in cities, so, too, is the salary. For example, a lawyer in rural southeastern Oklahoma earns an average of $72,000 annually, while a San Francisco lawyer earns $172,000 on average, according to the Bureau of Labor Statistics. With many young lawyers graduating with $100,000 or more in student loans, the bigger paycheck can be the deciding factor in taking a job. The South Dakota State Bar Association is hoping to change that by creating a rural practice task force to help bring more lawyers to small towns. A similar effort is underway in Iowa. "The numbers speak volumes about who we have - or don't have - in the rural communities," said Patrick Goetzinger, president of the South Dakota State Bar Association. "We're going to have some problems in delivering justice in these rural communities if we don't do anything proactively." One idea is to create a loan forgiveness program for lawyers who commit to serving a small community for a certain period of time, similar to programs for health care professionals in rural areas. Another goal is to improve job placement for lawyers' spouses, who sometimes have a difficult time finding work in rural areas, said Phil Garland, co-chair of the Iowa State Bar Association's rural practice committee. The programs aim to improve access to legal services and help preserve community life. People can say what they want about lawyers, Garland said, but there's no one more involved in a small town than an attorney performing pro-bono work or sitting on a local board. Poser said UNL identified a shortage of rural lawyers as a problem that needed to be addressed shortly after she became dean in May 2010. The university is developing coursework on solo and small practice law in response. A similar course is being considered at the University of North Dakota School of Law in Grand Forks. Rural firms also need to offer opportunities for students to test the waters through summer associate programs, Poser said. And everyone agreed mentoring will also play a key role in bringing more young lawyers to less-populated parts of the country. "You need someone to help you. If there are attorneys in these small towns, they need to actively reach out," said Jennifer Knapp, 32. She left her job in Minneapolis a few years ago to take over Libera Knapp Law Office in Winona, Minn., which has about 27,500 residents. Her old job offered a great salary, regular hours and friendly co-workers, Knapp said, but she disliked having little direct contact with clients. Browsing Craigslist one day, she stumbled upon a post listing a 100-year-old, third-generation law firm for sale. "I could not get it out of my head, so I responded," Knapp said. She met with the outgoing lawyer who said he would stay on for a year to ease the transition. But there was one thing that kept worrying Knapp about moving to Winona: finding a life partner in a small town. "It was a huge concern for me. It was probably the biggest thing holding me back," she said. Despite her personal misgiving, she purchased the firm and took it over in 2009. She has hired two attorneys - close friends from college and law school - to help with the workload, and she recently married a man she met in Winona. Knapp wanted to try something new - and it has worked out well for her - but she said no amount of mentoring or appealing to unemployed graduates will make someone happy in a small town if they don't already have that dream. Collin Davison, 24, does. He grew up in Garner, Iowa, which has about 3,100 people, and always planned to go back there after getting his bachelor's and law degrees at Drake University. "I wanted to be my own boss," he said. "I knew I didn't want to work for a large firm. Consequently, if I was going to start an office, I wanted to do it back home." It hasn't been easy. Davison has student loans to pay off, and he took out another one with a local bank to open his office a few months ago. He started with no clients and had to create a marketing plan to attract some. He knows it's a big leap to open a solo practice in rural Iowa right out of school - many of his friends remind him of how crazy he seems - but Davison said the quality of life makes it worthwhile. "At the end of the day, that's why I came home," he said. "I don't think there is a better place to live and raise a family."